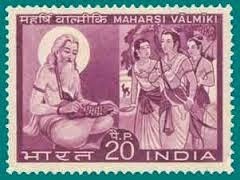 is in the Ramayana which is the first epic written by Valmiki. Maithili hearing these wonderful words of the monkey chief , became extremely happy because of this and became wonderfully alert, and told Hanuman the following words in a different way. Hearing these words which were told by Vaidehi with tearful eyes and which were capable of melting the mind, the great Hanuman who was the son of God of wind told the following words. (Sita tells him about her complete faith in him. She also is heart broken and Hanuman consoles her. She wonders how other monkeys and Rama would cross the ocean. Hanuman consoles her). “Hey broad eyed one. Hey lady with black tipped eye, is it not true that this talked to you? Those valorous Kinkaras who had very big belly . , who had very big teeth and who were horrible looking were eighty thousand in number . All of them with a desire for war and with a desire to catch the monkey left the house armed with thorny sticks and an arm called “Kotta”. Having reached the great stage which cannot be even neared by others , Hanuman became lustrous like Lakshmi(Goddess of wealth) and appeared like the Pari Yathra mountain. Hearing this great declaration one hundred powerful guards of the stage came out. They surrounded Maruthi and they rotated and threw at him several arrows , spears , swords , axes. That crowd of Rakshasa surrounding the monkey chief appeared as if they are a whirlpool in the river Ganges. Angry because of this that son of wind-god assumed a very horrible form. At that time Hanuman covered by the raining arrows looked like a mountain hidden by rain. Then the monkey chief after killing those chiefs of army along with their soldiers returned back to the gate and waited there similar to the God of death waiting to kill the people.